I'm still reeling from the announcement of Postopolis! – but the good news keeps on coming. Back in January, Alan Rapp, the art, design, and photography editor for Chronicle Books, attended a BLDGBLOG event hosted by the Center for Land Use Interpretation here in Los Angeles. Alan and I met, kept in touch, had a pizza, talked about David Cronenberg; and then, last month, we organized an event together in San Francisco. Somewhere in there the idea of a BLDGBLOG book came up – which I soon turned into a formal proposal... and now it's official: Chronicle Books will be publishing a BLDGBLOG book in Spring 2009 – and my head is spinning! 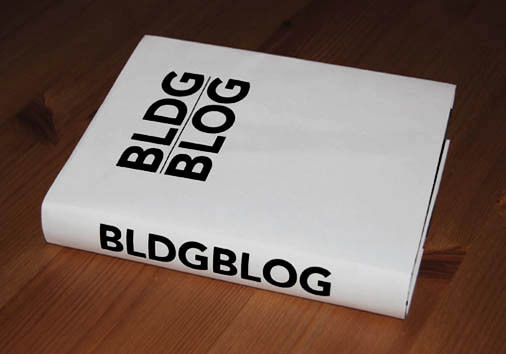 BLDGBLOG: The Book! 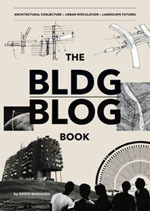 The BLDGBLOG Book! I just can't even believe how many possibilities there are with this thing. It's a little crazy. From plate tectonics and J.G. Ballard to geomagnetic harddrives and undiscovered Manhattan bedrooms, via offshore oil derricks, airborne utopias, wind power, fossil cities, statue disease, inflatable cathedrals, diamond mines, science fiction and the city, pedestrianization schemes, the architecture of the near-death experience, Scottish archaeology, wreck-diving, green roofs, W.G. Sebald, flooded Londons of the climate-changed future, William Burroughs, Andrew Maynard, LOT-EK, Rupert Thomson, The Aeneid, shipbreaking yards, Die Hard, Pruned, Franz Kafka, Rem Koolhaas, tunnels and sewers and bunkers and tombs, micronations, underground desert topologies, Mars, Earth, lunar urbanism, sound mirrors, James Bond, the War on Terror, earthquakes, Angkor Wat, robot-buildings and the Taj Mahal, Archigram, the Atlas Mountains, refugee camps, Walter Murch, suburbia, the Maunsell Towers... and about nine hundred thousand other topics, provided I can fit them all in. And, importantly, even if there's someone out there who's read every single post on this site – I know I haven't – they'll still find loads of new material. In fact, half the joy of writing BLDGBLOG has always been the comments, so I hope I can even figure out a way to include the best of them in the book somehow, either chasing down anonymous readers for permission or... something, I don't know, but the whole point is to be open to everyone's input and ideas. A questionnaire... What's your favorite bus stop in the world and why? Who knows – but this should be an absolute blast – and I'll make sure that the book is actually worth picking up. You won't just get a bunch of crap you've already read, reprinted word-for-word from the blog, served back to you for $30 (or $20, or $25...). But, man, I don't even know how many blogs make the leap into book-form! So I'm also nervous. But excited. And a little delirious with possibilities. Hoping that I do it right. 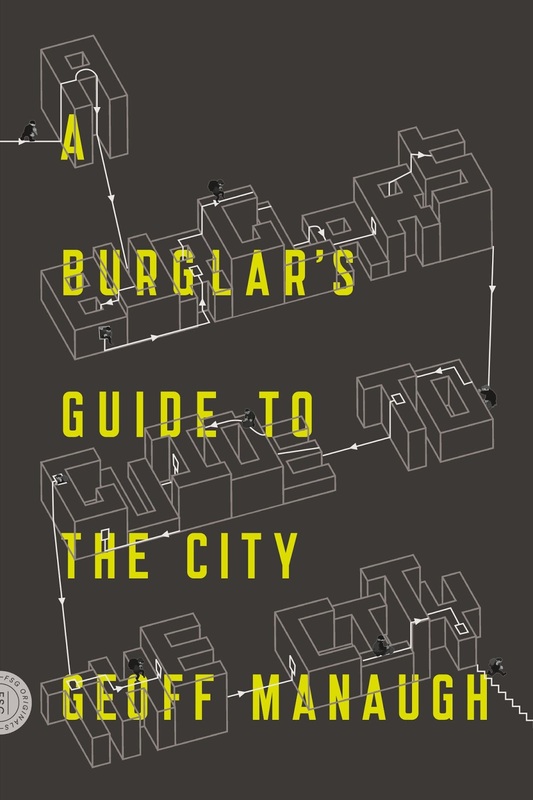 So look out for BLDGBLOG: The Book, or The BLDGBLOG Book, or whatever it will eventually be be called, coming soon to a Borders near you. Spring 2009. Chronicle Books. In a deal that never would have happened had it not been for Alan Rapp. And, of course, without so many hundreds – and hundreds – of people out there, who went out of their way to help BLDGBLOG find an audience – or who just did or wrote or built or made or said something cool, thus supplying me with material – I might never have started blogging at all. So I don't want to jump into some kind of Academy Award acceptance speech here, but I really do have to say thanks to dozens and dozens and dozens of people, including, but in no way limited to – hold your breath: my wife, for editing almost literally every single post I've written on this thing and making everything, universally, on all levels, better; Javier Arbona, Bryan Finoki, John Jourden, and Paul Petrunia, in particular, of Archinect for the early break, as well as the entire Archinect crew for putting up with me there; Alex Trevi at Pruned; Marcus Trimble of gravestmor; Simon Sellars at Ballardian; Sarah Rich and Jill Fehrenbacher; Jonathan Bell of things magazine; David Maisel; Cory Doctorow, Jason Kottke, William Drenttel, Jim Coudal, Bruce Sterling, Steve Silberman, Robert Krulwich, Lawrence Weschler, Douglas Coupland, Warren Ellis; The Kircher Society; all the people I've interviewed; all the people who have participated in BLDGBLOG events; all the commenters out there, both regular and one-time only, including people who have disappeared (or who no longer leave comments – I miss you! ); all the people who have sent me tips; Christopher Stack; Dan Polsby; friends of mine who were part of BLDGBLOG at the very, very beginning, before it even had a logo, including Jim Webb, Cathy Braasch Dean, Neena Verma, and Juliette Spertus; David Haskell of the Forum for Urban Design; William Fox; Ruairi Glynn, Abe Burmeister, Dan Hill, Régine Debatty, Chris Timmerman, Chad Smith, Dave Connell, John Hill, Jaime Morrison, Andrew Blum; Scott Webel; Matthew Coolidge, Sarah Simons, and Steve Rowell of the Center for Land Use Interpretation; Materials & Applications; Leah Beeferman; John Coulthart; Theo Paijmans; my del.icio.us network for linking to so many interesting things; Joerg Colberg; Siologen, Dsankt, and Michael Cook; Theresa Duncan; Curbed LA and SF; Jörg Koch; Steven Ceuppens; Yahoo!, Time Magazine, MSNBC, The Guardian, The Wall Street Journal, The Architectural Review, Mark Magazine, Artkrush, Planetizen; Thomas Y. Levin and Annette Fierro, for letting me sit-in on their classes, free, way back in 2004, leading directly to the birth of this blog; my family (including in-laws! ); Blogger; and about ninety-nine million other people, things, places, friends, writers, editors, architects, and on and on and on. BLDGBLOG would have folded up and disappeared long ago were it not for the encouragement of people who it would take me literally the next two days to thank completely. So thanks – again – especially to Alan Rapp and to Chronicle Books. Meanwhile, expect to hear more about all this as I set about actually writing it... And I'll hopefully see some of you in New York City next week for Postopolis! (Note: I'll add more links and such in a little bit – including the names of people who I'll realize, with horror, that I forgot to mention). "A BLDGBLOG book Flickr pool, perhaps... "
Congratulations. Should be a good book. congratulations! this is one of my staple blogs and i can't wait to see it in the physical world. Congratulations! I've never commented before but I am a longtime reader of your blog and I'm sure this is going to be something to look forward to. congratulations!!! this is fantastic. the only thing i would suggest, and i'm sure you've already thought about it... include as much SCI FI as possible!! i've found this particular little sub-genre or section or idea or whatever to call it, to be a gem on this blog. keep it up. BLDGBOOK should have at least one pop-up. Preferably a habitable one. The middle 20 pages are a vinyl tearout that you plug in to an air compressor and selectively inflate until you have a house/sculpture/blobject that suits your fancy. Then take a photo, upload to the proper URL, and the e-ink pages in the back of the book wirelessly update with your CC-licensed work. Congratulations!! Good, then I can finally read bldgblog in bed. Its a great idea. Always wanted to see this blog into a book!!! Congrats Geoff and nice book mock-up. I almost jumped out of my seat when I saw the picture. Congratualtions, on being the first member of team CatDog to hit the big time! Wow, super congrats! I can't wait to hold it. That is very inspirational. Thanks! congrats Geoff i can feel your excitement. ...and a Flickr pool could be enough to generate most of the images you'd need for the book. Congratulations, G! You deserve it. And to think Neil and I can say we knew you when . . . well done! And your nod to Nic was impeccable; I too think she makes . . . everything, universally, on all levels, better." That's fabulous. I'm going to go pre-order this now. Congrats! Congratulations, Geoff - both on the book and on writing one of the most consistently rewarding blogs I read. I tend to try to avoid buying books these days, but this one I will buy for sure. Congratulations! In a world filled with crappy and boring blogs, and annoying and useless books, it is a real pleasure to be able to look forward to a decidedly non-crappy blog being turned into an interesting and useful book. Best of luck. How about "The Whole Notional Earth Catalog" ? or "This Old Blog" ? Please send me a fat stack before next christmas! Awesome! Congratulations, this is a great accomplishment. I've got a spot reserved on my nightstand and in my Amazon sidebar for the book. So I promise it'll be a good book... And I'll basically start in on the thing, full-time, when I get back from Postopolis - keeping everybody updated if there's some kind of commenter participation thing, or a Flickr pool, or a this, that, and the other way to experiment with the book form. So many possibilities! For now, though, I'm still getting everything set up for New York - so it might be a few days before a new post comes up - but thanks again for the comments! And, seriously, if you have things you love/hate about the blog, or that you really want to see developed in the book, let me know. I really want this thing to be good. It'll be the worst ever contribution to architectural discourse. "Complete loose-stool water. Arse-gravy of the very worst kind," to quote Stephen Fry. Outhouse paper of the Indian burn variety. Shelved next to Daniel Libeskind. Meanwhile, I'm just happy to be joining the catalog along with this book. Next question now is, will there be a Postopolis! The Book! (doubly exclaimed)? Congratulations! I can't wait to pick up my copy. I'd love to see anything you might put together on bicycling and urban design. Best of luck Geoff. And no need to be daunted, look at all those entries in your archives. I agree that there should be some kind of expanded aspect to this. Flip the secret switch and it folds out into a miniature geodesic dome that not only provides shelter but reveals the hidden extra chapter imprinted on the interior panels. Might be hazardous for airplane reading though. Spring 2009? It's too long to wait. I expect it will be published in end 2007 or at least mid 2008. Geoff, if you kindly held a contest which the winners will have your book as the prize, free. Woooo! Way cool! I'll be down for a copy or seven, for sure. Does going tangible equal "the big time"?! In any case, congrats, that's fantastic news! Can't wait for an autographed copy!! Congratulations! Yeah! I want to congratulate you too! Congratulations! Congratulations, this is such great news. 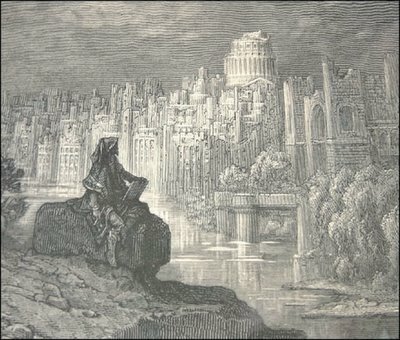 I look forward to more postings on this and hopefully great discussion on the nature of architectural literature and on architecture in literature. As far as things I love/hate about the blog, the simple format of fact/image/imagine... works superbly on this blog, but with the far vaster real estate provided by a large format book's page, I am curious to see how you will visually juxtapose architectural criticism/highlights, images of contemporary or planned architecture, and then the lovely speculations that so often begin with the incantation 'imagine'. Can’t wait! I'm willing to help in any way possible. Maybe you could pair up with the other Chronicle book you linked to and have BLDGBONG! Hey Linda, and Dech, and John, and John C, and Marcus, and everybody! Thanks for the comments. So I might have to get used to the idea of calling it BLDGBOOK - but you never know. If it gets made into a movie... BLDGFILM. If I get my own office tower: BLDGBLDG. If it becomes a TV series: BLDGSHOW. Anyway, thanks for all the encouragement - now I actually have to write the thing... But hopefully I'll see some of you in NYC before the long slog sets in? And I'll start posting again soon, too. And thanks for the tips/thoughts about content. I absolutely look forward to seeing your sence of place and wonder hit the shelves. I have a few people in mind who need copies. fantastic! i honestly cant think of a better blog to make it to book form. Enhorabuena!!! maybe hardcover copies come with a CD containing hypertexty items and/or similar html / digital media info to help spark interplay between online blog + offline book? I've been reading your blog for quite some time now and I love it. It's about time! I've already put it on my To-Buy list! BLDGBLOG is beautiful, thought-provoking, and chock full of content updated often and lovingly... I'm sure BLDGBOOK will follow suit. Frankly I'm surprised that it took this long for a book deal to be offered. Please include at least a brief bit on micronations, and some good DIY architectural material for the 21st Century! I'll look for you next week on Sat. June 2 when you're in NYC for Postopolis. I wrote about the Storefront's exhibit about late Soviet architecture on my blog recently..
congratulation mate, yoour blog is wonderful...i love it..
Congradulations! Can't wait to read it!! Woohoo Geoff! Congrats, can't wait to sink teeth into this book. maybe part could be edible. A BLDGKY would be nice, or at least a BLDGDISC with some audio/video. How else can we listen to Manhattan bedrock, earthquakes, etc? Maybe an LA map with future coastlines and historic sites on the BLDGTOUR? Anyway, it'll be a blast - and I'm unbelievably excited to jump right into this thing and make something good. Great. Excellent. And I'll keep everyone updated. I also want to figure out what to do with some reader comments - do I include them in the book...? Or should I just quote them, like a newspaper article...? But I'll figure that stuff out and keep the fun bits for the public. a book is great, but will there be a movie too?...or am i going to have to learn how to read? good on you mate, that is very very ace geoff! Congratulations, Geoff. However, this must be one of the most painful waiting I would have to endure. LOOKING FORWARD TO HAVE THAT BOOK!!!! I'm reading this blog for such a time and i think that is one of the most interesting place for Architecture.... Wishing you best in your "project"!!! Where can we register interest in getting a copy when it comes out? You'll be able to buy the book through Powells, Amazon, Chronicle Books themselves, and, hopefully, most bookstores. It should be available for pre-order by November or so. Brilliant! You are an inspiration to bloggers everywhere. 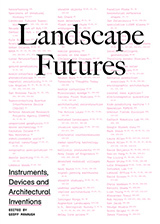 I'm interested in getting a copy as well, and when you're listed on Amazon I can feature it on GreenLid.blogspot.com, my landscape architecture resource site. Filed under 'inspiration' of course. This book is the result of the tenacious work you have done for years, congratulations! I think it's great to still have people like you encouraging the architectural discourse by celebrating diversity of thoughts, opinions, reflections. First, I would like to say that it is very handful to have the blog discussions printed, but you need to put special attention to the way they are organized within the 3 chapters, in the sense that it should become a practical book responding to the divergent interests of its readers...so I would suggest that every article can have at the beginning a small index, or to use a simple theme categorization or keywords. I would also suggest that the book can give the opportunity to separate/mark the information that interests us, by adding personalized tabs (enclosing adhesive labels? like in the moleskine ‘city notebooks’). Second, as the comments are the core of this blog, I would suggest two things: one, to leave a blank space at the end/side of each article for personal reflections; and two, to add a detachable sheet at the end of each chapter (with your address/postage info on the back side) that can be filled out with our thoughts, ideas, motivation comments, comparisons, links, etc about the blog, the articles, the book, the approach, that can be sent back to you, and some of them can be later published/discussed on the blog. Third, keep it as simple as possible, the important thing is the content. And the questionnare is definitely essential!